I have come to the conclusion that status updates are going to just be a permanent fixture on the site 😉 I have been doing these now for what? Four years almost?!?! I just think it speaks to difficulty of obtaining your CCIE. This week I was actually ready to walk away and talk a long break and maybe start up my CCNA Security. I think in the end though the mounting pressure of a new child on the way and other outside forces just temporarily pushed me past a breaking point. One thing I did do was alot of soul searching the last few weeks. I need to accept the fact I am not being honest with myself. Whenever I would hit a scenario in a workbook that was over my head I would get frustrated and just blame the workbook. Instead I should have just blamed myself and accepted the fact I didn’t know that particular topic as well as I thought I did. This would drive my “ADD” with different vendor material back and forth, and I think that was making matters worse. The good thing is I can rewire my rack blindfolded and with only two hours of sleep 🙂 After this week with getting the last of the house in order I need to sit down with the CCIE checklists and work from there. I need to settle down on what material to use and just move forward and finally bring this chapter of my life to a conclusion. If the writers of “Lost” can do it I think I should have no problem doing so right? A good quick read if you own any of INE’s material or are thinking about purchasing. Looks like volume II is getting a big update and the video companion series is still being added on to. No dates yet on the completion though. More full labs walkthroughs are on the way for the Video Companion…we are waiting for an incredibly exciting re-release of Volume 2 that is happening very soon. Bug fixes, better explanations and verifications, and a full blown 2-hour Troubleshooting section in each lab. Wow! The troubleshooting section to each lab will be a welcome addition I am sure to alot of people. 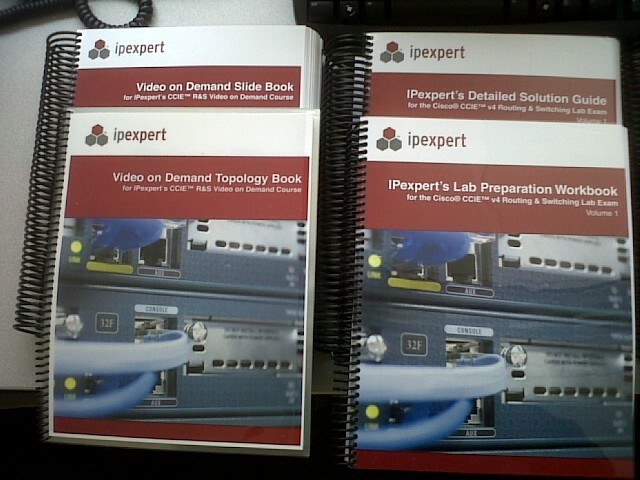 Even though I have all the labs in electronic format I like to have hard copies to read when I am not labbing. It gives me a chance to work through scenarios ahead of time. 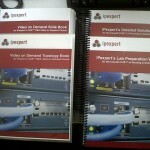 As you can see IPX’s Proctor Guides are very thick with details to help break down each task for you. I got a few emails asking about attending Cisco Live. Sadly I won’t be able to make it this year. What breakouts would I recommend? Breakouts that you are going to benefit from the most or ones on new technologies you are looking for exposure on. If you are looking for any dealing with EIGRP and Don Slice is doing any this year make sure to attend his. His breakout on “The Care and Feeding of an EIGRP Network” was the best I attended last year! It has been a couple of weeks since I wrote on my troubles with moving forward. One of my conclusions with everything was that I am a bit bored of the material. Whether it was topic specific or full labs, it didn’t seem to matter. Working with INE’s Vol 2 I noticed that one drawback was I seemed to be working more from memory than knowledge. A lot of the guts of the labs seemed to be in my memory which I felt wasn’t going to work. I received my updated BLS drive from IPexpert two weeks ago and decided this is what I am moving forward with. New labs and new VOD’s can’t hurt at this point. Plus, I think this is going to give me a real indicator of where I’m really at. At this point I can’t work a particular schedule because I still have to finish the new little guy’s bedroom. Good news is my office is officially moved down into the basement so at least all my equipment is in it’s permanent location. My dynamips lab has been rewired to match IPexperts topology. I have three 2620’s to act as my backbones to take them out of virtual topology to keep the processor utilization low. I edited their current topology file to match my setup. Once I got the usb nic’s straightened out, everything came right up. All the routers are running as 3725’s and utilization is around forty percent. My goal is to work through everything and hopefully be ready for some mock labs from INE by September and schedule my lab for around the same time as last year. There is going to be a big drop off in time once the baby is here in July so I have to plan for that. At least the new little guy will have a lot of Cisco doc material to read through during the night feedings. IPexpert has it up on their blog too! Did I miss a conference call or something? News that everyone has been expecting eagerly: Cisco is taking the core knowledge section off the CCIE R&S and Voice lab exams! Over a year of existence, this part of the exam received most controversy of all. There has been a lot of things said about how flawed the idea of core knowledge testing was. Firstly, a test of four questions could never properly assess anyone’s knowledge. Secondly, error margin was unacceptable high due to vaguely presented questions and unclear grading procedure. Lastly, some recent promo actions that Cisco ran created a lot of controversy in the CCIE community. 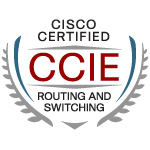 However, good or bad, it’s all gone now, and this fact should be a huge relief for many CCIE candidates. Gang – More news coming shortly, but as of a few minutes ago – Cisco has officially announced that there will no longer be OEQs (Core Knowledge) for CCIE R&S and CCIE Voice tracks. Details (on this blog) and our technical community (www.OnlineStudyList.com) coming shortly.